Italian Pasta Salad | Om nom nom! 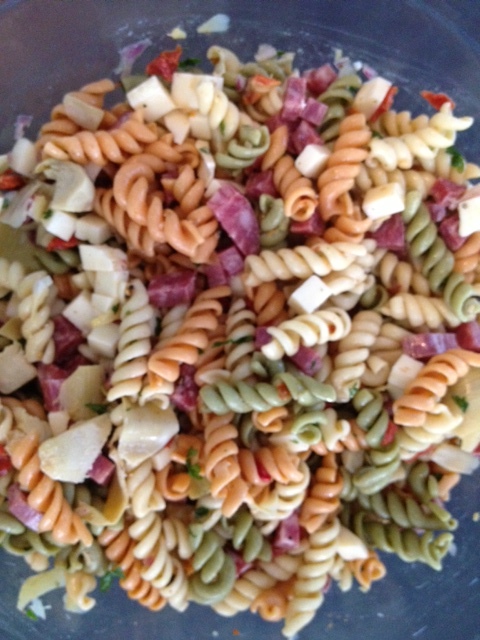 This is a great pasta salad to have as a meal or as a side at a picnic. Lots of flavor and easy to adjust to tastes. I got this one from Chowhound, and we made this one for our Memorial Day picnic. Place the onion, vinegar, and oregano in a large, nonreactive bowl and stir to combine; set aside. Bring a large pot of heavily salted water to a boil over high heat. Add the pasta and cook according to the package directions. Drain and rinse under cold water until cool. Drain any excess water and transfer to the bowl with the onion-vinegar mixture. Add the remaining measured ingredients and toss until evenly combined. Taste and season with salt and pepper as needed. Serve at room temperature, or prepare up to 1 day in advance and refrigerate until ready to serve.